Welcome to Small Success Thursday, where we get together and cheer each other on for our little milestones over the last week! 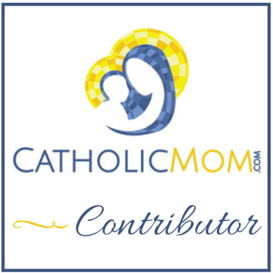 We’re hosted by CatholicMom.com, where you can leave a link to your list and catch up with everyone else’s happy reports. Okay, that’s a total lie. My kids are more socially adept than I am, have more friends than I dreamed of at their ages, and can talk to anyone of any age with comfort that I actually envy. But what we don’t have are school dances, formals, and proms. I mean, I have two students – both girls. That would be the lamest prom EVAH! But there are lots of other homeschoolers in our area, so many that there are two rather large homeschooling organizations. And one of these groups has an annual Winter Ball and an annual Spring Ball. Both events are held at a huge Baptist church near us, and they maintain a strict dress code that mirrors the one we’d impose, anyway: young men in dress shirts and ties (coats preferred, but it’s okay if they don’t have one); young ladies may not wear strapless or spaghetti straps (unless she also wears a shawl or shrug at all times), nothing above the knee, nothing too low-cut. You know, modesty! This year, our 15 year-old wanted to go the Spring Ball, which is tomorrow. She doesn’t have a date, but she got a ticket and is going to go alone and hang out with her friends. Let me tell you, that’s nothing I would do even NOW, let alone at 15. School dances were one thing, prom was another! Yet she’s happy to be going. Speaking of my 15 year-old doing thing I never could do at her age, let’s talk about her soccer team a little. She’s on a homeschool rec league that plays against Christian schools who are unable to play against the public schools in our part of Virginia. She moved up to Varsity this year, and they’ve got 24 girls on the team. First season on Varsity + 24 girls = not much playing time for her this season. She’s a little frustrated by it after having been a starter for so many years, but she’s learning to deal with being a second-stringer. Even though teams for little kids focus on “Have fun, everyone plays,” this team is playing for a championship. If the game is close up until the last minute, the starters don’t sit down on the bench so someone else can have minutes in the name of fairness. So, sitting on the sidelines, she normally pays attention to the game so she can learn what’s going on, just in case she gets the go-ahead to play for a few minutes. However, Tuesday’s game was different. The girl was a bit evasive about it, but it all started coming out during Tuesday’s game, as the second-stringers sat on the bench. Apparently, my daughter discussed Mary, the Immaculate Conception (complete with mud-puddle analogy), the pope, the saints, the Rosary, and whatever else they threw at her. My daughter was evangelizing her teammates. Finally, let’s not leave out my sweet 12 year-old and what I helped her accomplish. We have a local Pro-Life organization that runs ads on local TV and buys billboards promoting adoption near the local Planned Parenthood. Every year, they have a poster contest for elementary students and essay contest for middle and high school students. This year, I asked my younger daughter to write an essay on the given topic of “Why Life is Important.” We submitted it back in March, and I had pretty much forgotten about it until this week. We got an email from the group saying that her essay was selected as an Honorable Mention in the Middle School division! We’re so proud of her! I’ll have to get her permission to share the essay here, but aside from me helping her edit it and polish it up a little (plus a little brainstorming to start), she wrote the essay herself. 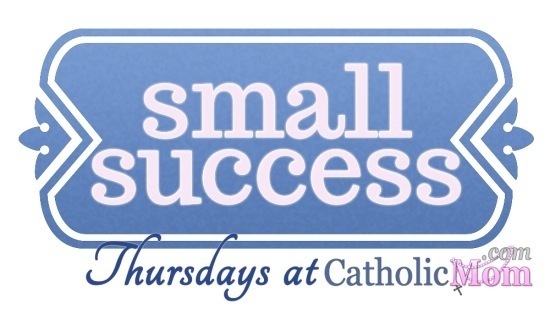 Be sure head over to CatholicMom.com for more Small Success posts! What’s the mud puddle analogy? The Mud Puddle Analogy is that sin is like a mud puddle. We fall in the puddle, and God reaches out through His grace and pulls us out of our sin, cleans us up through Baptism and Confession, and we go on our way. With Mary, He prevented her from falling in the puddle to begin with, starting with her Immaculate Conception, and provided her with the graces to avoid future mud puddles. Thanks for clearing up the Mud Puddle thing. What a simple way to explain the Immaculate Conception! Very cool. I have a 15-year-old myself, and your daughter sounds amazing to be defending her faith like that. I bet she will be beautiful for her dance! Your 12-year-olds pro-life essay must be inspiring. Congratulations! I very much enjoyed hearing your successes for the week. against it. Just trying to find the right fit for our family. I LOVE how you use humor to nip the “but-homeschooled-kids-aren’t socialized” BS! And you must be ONE PROUD MAMA that your daughter was evangelizing her teammates, as you mentioned! I found myself cheering with her; that is SO AWESOME, especially for someone that age to have that level of courage. BTW, where do you live? If you are surrounded mainly by Baptists, I would guess you live somewhere in the South. We live in a very Anabaptist area – surrounded mostly by Amish and Mennonites – so we have many opportunities for evangelization, as well. We’re in the Blue Ridge Mountains of SW Virginia. Catholics are only bout 4% of the population here. It’s a big reason why I helped my girls learn to defend the faith.